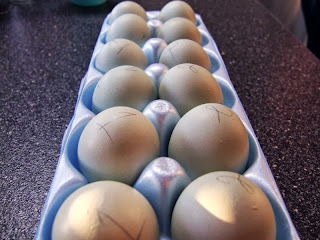 Remember these eggs? The ones I was so worried about because they'd been shipped from Texas, and looked scrambled inside? Only four eggs have hatched so far, but they are a day early, so I have hope that their brothers and sisters will hatch, too. I don't expect all 12 to hatch they way I would with eggs that hadn't been beaten up, but I already feel like I've beaten the odds with four healthy-looking chicks. 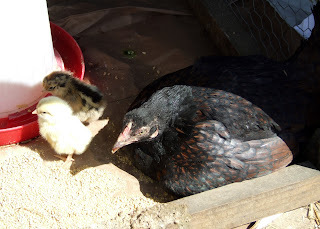 I didn't take a close look other than to lift up the hen, see the chicks, and let her settle herself down again because I didn't want to disturb her more than I already had. 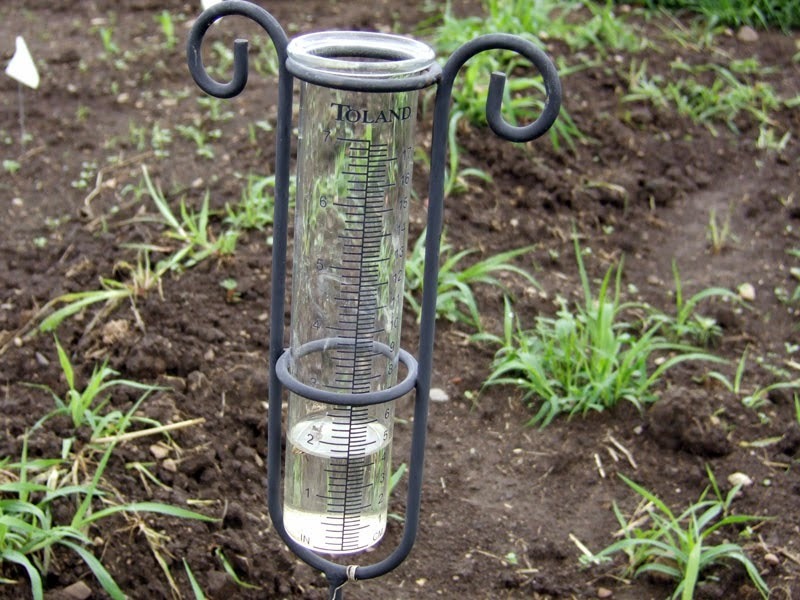 Does your rain gauge look like this? This is just 24 hours of rain. Everything is soaking wet, the tomatoes taste watery, and the weeds are running rampant. Outside work has ground to a halt, so I thought I'd give you another look at the breeds of chickens we keep here at Red Wicket. Nothing seems more fitting than profiling the new mother. 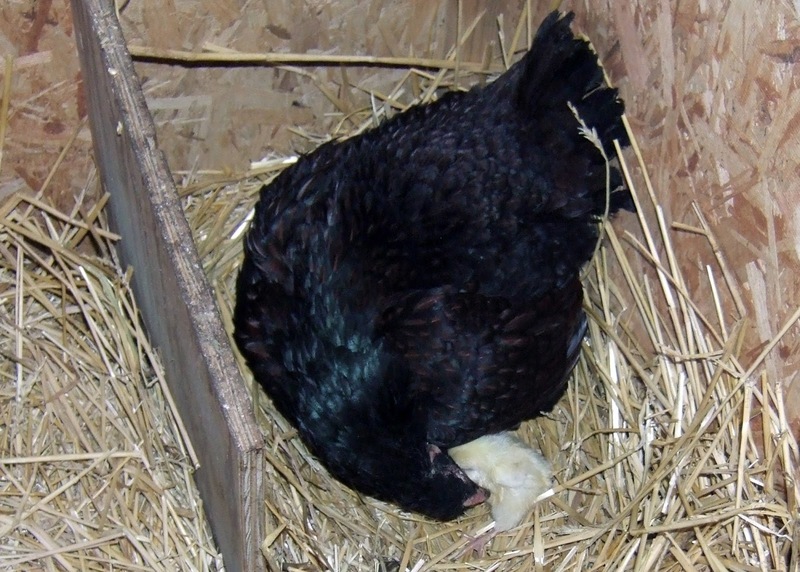 The Dark Cornish is an old breed, first recognized in 1820 in England, and called the Indian Game chicken. Their name was changed to Cornish in 1910, which is far more appropriate since they are a breed from Cornwall that has no connection to India. Cornish have very different feathers than most chickens; they are called "hard feathered, " which means that their feathers are held very close to the body with no down underneath. This makes them much heavier than their size would suggest, because they are all muscle with no fluffy padding. Dark Cornish have cool feathers that are dark brown with green markings. 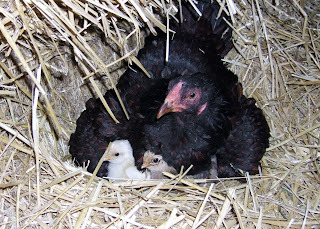 According to the American Livestock Breeds Conservancy, the breeder meant to make a wonderful, all-around bird that had lots of meat and was a good layer--but they failed spectacularly. 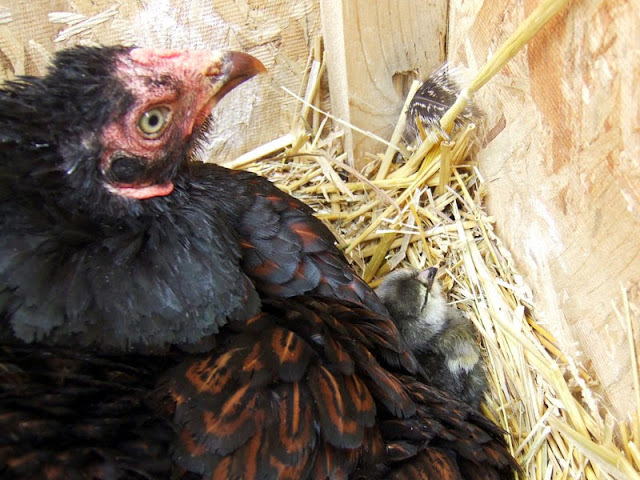 In fact, one source in the 1800's said they "…are nearly if not quite the worst domestic fowls for ordinary use." They are terrible layers, laying only two or three medium-sized off-white eggs every week. They also eat a lot, and grow fairly slowly--certainly not good attributes for a layer breed! This breed would have died out but for the fact that they have such wide and meaty breasts. Breeders found that they could sell these birds as meat birds very young--if you've ever had a Cornish Game Hen, this is the ancestor of these birds. The second thing that the breeders did with the Cornish changed the way the world eats chicken forever. 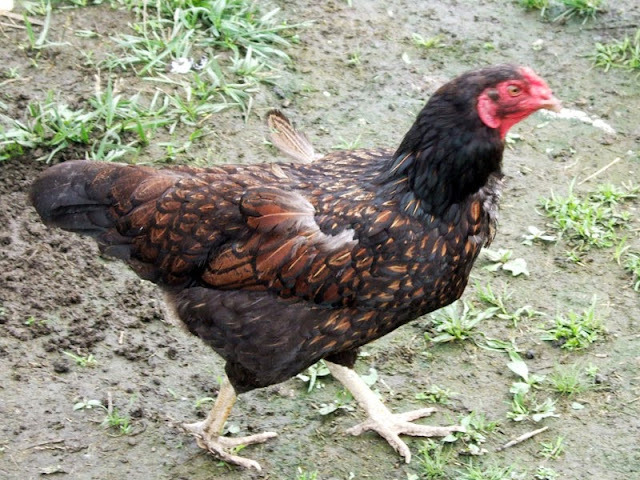 By many years of selective breeding, breeders crossed a white Cornish with a white Rock and made the modern commercial broiler chicken, also called a Cornish/Rock Cross. While modern broilers and dark Cornish don't look much alike, it's thanks to the dark Cornish that we have such a large supply of relatively inexpensive chicken meat on the market. You're probably asking yourself "why would Red Wicket keep birds that are known to be such a terrible choice for a backyard flock?" It's certainly not for their egg-laying ability! Dark Cornish, being a fairly rare breed and one that's not popular for backyard flocks, is still pretty close to the original bird. 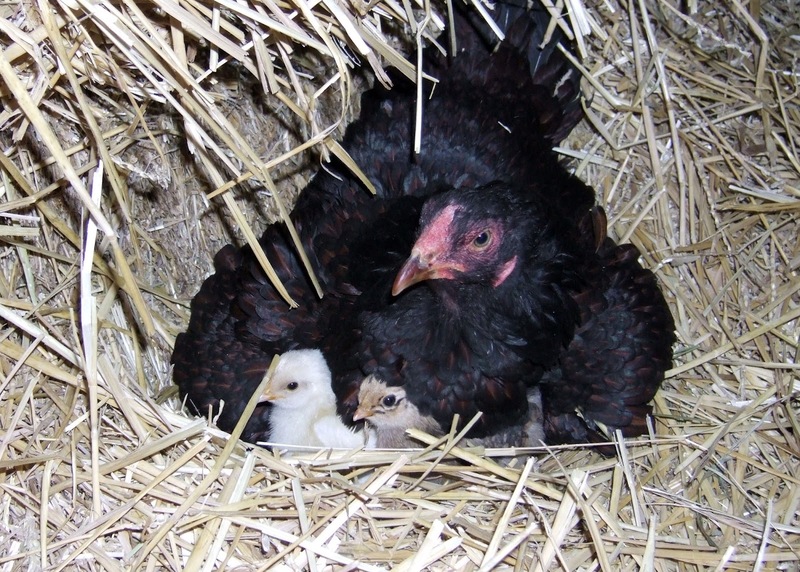 They still have their mothering instincts, which have been bred out of most layers since a hen does not lay eggs while she is broody. They also retain their game bird attitude, which means that they are tenacious sitters and protect their chicks aggressively. Our three Dark Cornish have each hatched a clutch of eggs for us this year, and they haven't lost a single chick. 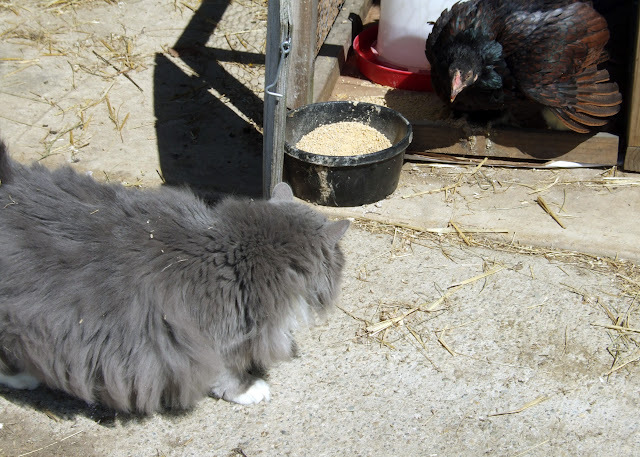 We've used other breeds as mamas, but some don't protect their chicks well and the chicks are killed by the cat or other chickens. The dark Cornish will protect those chicks against all comers, and you don't want to cross her!